Rosina Roccamo has only lived in Holland Hall for about a week and has yet to exchange words with a guy on her floor. Holland Hall — like the rest of Schenley Quad — was built in 1924 and originally served as a living space for affluent Pittsburghers. The University bought the buildings — then called the Schenley Apartments — in 1956 and repurposed them to house up to 600 students. Holland was one of Pitt’s two all-female dorms — along with Amos Hall, home to 10 of Pitt’s sororities — and the only one open to incoming students. This was the case for about three decades, beginning in the 1980s, when Pitt converted it from co-ed housing to an all-female residence hall. Roccamo, a first-year molecular biology major, said she learned Holland Hall had recently gone co-ed in the housing pamphlet the University sent out in early spring, but the information wasn’t really a big deal to her. Sejla Jukic, a grad student in Pitt’s school of pharmacy, has been at Holland since her first year at Pitt. Although Holland wasn’t her first choice for a dorm, she ended up loving it. “I barely knew anything about the building when I got there, but I was sold on how friendly people were and how much female empowerment and safety was stressed,” Jukic said. Jukic is now entering her fourth year as a Holland resident and her third year serving as a resident assistant there. When she heard the building was going co-ed last year, she was very eager to get involved in the process and help make the building more inclusive. Jukic said the transition of the building to co-ed has been a peaceful one. First-year Sam Levi said Holland Hall was one of his alternate choices for housing, his first choice being Nordenberg. An older female friend of his — a first-year living in Holland at the time — encouraged him to put Holland as an alternate after Pitt announced it was going co-ed. “I figured I wasn’t going to get into Nordenberg considering how popular it is, and Holland’s rooms were nice-looking and bigger than Towers anyway, so I decided to take her advice,” Levi said. But while Levi may have known some female Holland residents before he himself moved in, he doesn’t know any now. Instead of the gender alternating by floor, such as in Towers, or designated by suite like Sutherland Hall, Holland’s male and female residencies are split down the middle of the building. Men make their homes in Holland South, while women retain the North Hall. 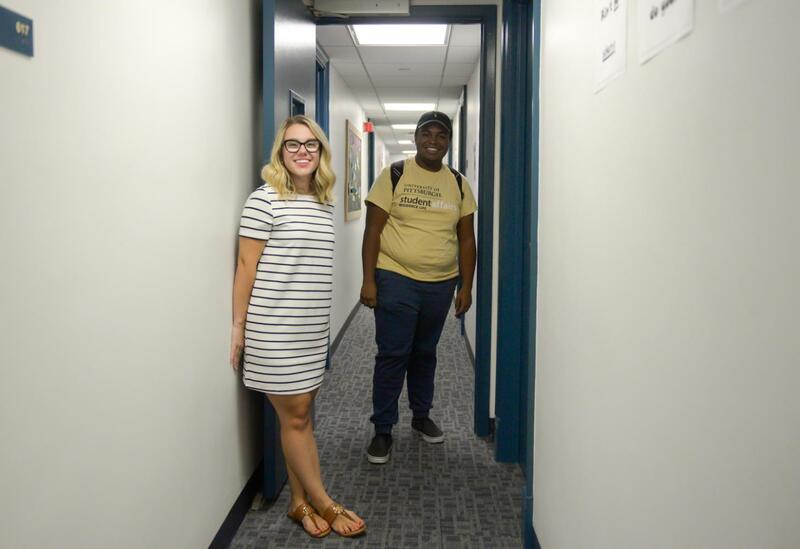 Kristin Steffes, a first-year planning to major in biology and psychology, said the door in each hall that separates the North Hall and South Hall generally remains closed, with the inhabitants of each side usually encountering each other mostly in the 11th floor lounge and laundry rooms. Tara Kim, a first-year looking to major in biology, said Holland is still a good place to live for people who feel most comfortable living with people of their gender. “Considering I haven’t even seen any of the guys on our floor yet, I’d say it’s still a good place for people who want to live in an all-male or all-female space,” Kim said. Unlike Kim, Jukic said she’s seen plenty of intermingling between male and female students in the lounge and among the halls. But she agrees Holland would still suit students looking to stay in a mostly male or female area. Levi said that given time, the two sides of Holland may come to interact more with each other as they settle into college life. “I think after everybody gets acclimated to their living space and the people they live with and just, you, know, being out here, then everybody will get acclimated to each other,” Levi said. For now, though, South Holland Hall has been converted into male territory. Jukic said the Holland RAs are currently working on creating a series of events focusing on both female empowerment and healthy masculinity.